Keith Teare was engaged in a dangerous game of chicken with Microsoft, there is little doubt. As I've explained, Microsoft was obsessed with data quality and avoiding a poor navigation experience for its users. The Microsoft/RealNames contract negotiations lasted over six months, the majority of which time was spent discussing and documenting the matrix and the detailed standards by which RealNames was required to review all pending Keyword registrations. The integrity of the Keyword data being distributed through the Microsoft browser and MSN service was far more important to Microsoft than any other provision in the contract -- including the financial and equity "investment" provisions. Despite signing a contract with Microsoft which obligated RealNames to adhere to the highest standards of approving names, Keith constantly pushed outside the boundaries of the contract. When RealNames' Fortune 500-focused "Brontosaurus" sales strategy inevitably failed in late 2000, Keith conceived and implemented a new business model. Under this revised strategy, the focus on high end, multimillion dollar Keyword sales would be abandoned in favor of a mass market approach. As a result, most of the direct sales force was summarily fired in a RIF conducted in December 2000, and the company promptly began re-architecting its registration system to enable third parties to sell keyword registrations on a first-come, first-served basis, without regard to appropriateness. Even I'll admit that this approach made some business sense in the abstract. It was certainly a far superior idea than trying to sell a package of Keywords like "Cadillac" to General Motors for 1% of its annual advertising budget. Moreover, the idea of partnering with domain name registrars who could bundle Keyword sales side-by-side with sales of .com, .net, .org and other domain names was a compelling idea. But there was one huge problem with this idea: it was a clear breach of the Microsoft contract. Keith was advised of this, and he was repeatedly cautioned that RealNames would not only expose itself to potential legal liability, but would also risk an outright termination of the contract. Many people in the company believed that RealNames should simply talk to Microsoft and try to negotiate some relief from the rigorous "matrix" requirements that would enable the sale of Keywords on a more automated, mass-market basis. Keith pooh-poohed the idea. He believed that RealNames could simply create a subscription filter that would block the registration of well-known brand names and popular generic terms, and that this would pass muster. He ignored the dangers, and plunged ahead with his strategy without fully revealing the details to Microsoft. When RealNames new "distributed registry" model was implemented towards the end of the first quarter of 2001, RealNames stopped adjudicating keywords and instead relied on the subscription filters to police the registration of Keywords that would contravene the "must review" provisions of the Microsoft contract. The filters, however, were inadequate to catch every conceivable brand name, trademark or generic term. As any astute reader would surmise, there is a virtually infinite number of generic terms and phrases that can be strung together to create a Keyword. RealNames could not possibly expect to catch them all, especially when you consider that it only had real expertise in the English language (but was nonetheless accepting registrations in scores of languages). Instead, RealNames was relying on some bastardized form of the "80/20" rule: it would catch the 20% of generic or hijacked terms that would theoretically result in 80% of the potential revocations. Predictably, however, a "land rush" mentality took over and people started registering all sorts of generic terms in all languages. Microsoft ultimately got wind of this in March of 2001 and soon stopped accepting new uploads of Keyword registrations. According to to an email sent by Bill Bliss of MSN in the Spring of 2001, Microsoft stopped accepting new registrations because "there was an unacceptably high level (25%+) of generic terms expressly forbidden by our agreement." Keith admitted that he was deliberately pushing the envelope with Microsoft to get them to accept the new business model as a fait accompli. Keith believed that if RealNames signed up enough registrars and sold enough Keywords (generic or otherwise) before Microsoft had a chance to object, Microsoft would be compelled to accept the status quo as a done deal. He torpedoed the idea of actually sitting down and talking to Microsoft to try to strike a better compromise on the contract terms. Pushing Microsoft to the edge was his modus operandi. Unfortunately for RealNames, Microsoft did not subscribe to Keith's view of the world. They wanted RealNames to adhere to the contract it signed in March of 2000. However, Microsoft did not switch off the service and terminate the contract for breach, as it probably had every right to do. Instead, in a remarkable show of good faith, Microsoft offered to negotiate an amendment to the contract to allow RealNames to at least sell "low frequency" generics (i.e., generic and other terms that had either no incidence, or a very low incidence, in the query logs from the MSN search engine). The theory behind this approach was as follows: RealNames would be able to at least sell some terms on a first-come, first-served basis (RealNames called these terms "Basic Keywords"), so long as it continued to manually review all "high frequency" terms (these were known as "Keywords Plus"). At the same time, Microsoft would maintain a positive user experience at least with respect to those terms most often queried by users of its browser and search engine. This compromise was reduced to a formal written amendment months later in September 2001. Teare on Keyword Sales (page 10): "Cumulative registrations of paid Keywords into the RealNames System since June of 1998 are over 900,000." Hmm, let's see. Since RealNames historically charged anywhere from $50 to $299 and upwards for a keyword, that sure would equal a lot of revenue. Taking a theoretical price of US$100.00 per keyword, 900,000 keywords would equal $90 million in revenue in the last four years. RealNames has never done anything close to that in revenue. The math just doesn't add up. Teare on Keyword Usage (page 8): "In January 2001 RealNames processed about 40m uses of a Keyword (a resolution in our language). This measures when a Keyword that is in our system is typed by a user into the browser and our system delivers the appropriate web page to them. . . . We delivered more than 450m resolutions of a Keyword in Q1 2002, representing 33% annualized growth." Wow! Those sure sound like impressive stats. At that rate, you would think the whole world used and loved Keywords. But ask yourself, do you know ANYONE who uses Keywords? Who are these 40 million people? OK, maybe that isn't the most empirical way to debunk these stats. So let's instead look at the chart that accompanies the statement quoted above. You will notice two things that disguise the reality. First, what looks like an astounding 75% of RealNames' resolutions from Q4 '02 and Q1 '02 come from something called a "Framed Testbed" Keyword. What is that, you ask? Keith does not explain what the term means because he is hiding something. Allow me to explain. A framed testbed Keyword is a keyword that is not sold to anyone, but that is inserted by RealNames into its database (without cost) for the sole purpose inflating its resolution statistics and "driving user awareness." Here's an example: Type Wells Fargo into your IE browser and see what happens. Wells Fargo is not a paying customer of RealNames. Never has, and (it would appear) never will be. Secondly, take a look at the growth from Q4 to Q1. The "33% annualized growth" touted by Keith occurs entirely in the framed testbed category. I'm sorry -- is this supposed to impress us? Is this the juice that is going to make Microsoft apologize and say that it made a mistake in not renewing the agreement? You might as well shout from the rooftops: "We give away our product for free and are still only growing it at a 33% annual run rate!" Teare on RealNames' Prospects (pages 2-3). "There have been 3 successive quarters of revenue growth. . . . RealNames has a long-term, viable business model that is poised for significant growth over the coming quarters." Let's examine the viability of the RealNames model for a moment. Take a look at the financial statements/revenue detail provided by Keith on page 13. Of the $4,856,000 in revenue reported for Q1 2002, $2,574,000 of it -- or a whopping 53% -- comes from a beast called "Keyword Management Services". Keith vaguely describes these services on page 6 as "a managed version of [Keywords and Keywords Plus] plus some special services for e-commerce customers". Well, as the esteemed Senator Reid is fond of saying, you can dress up a pig however you want, but it is still a pig. "Managed Keyword Services" is nothing more than RealNames entering affiliate programs of e-commerce companies. This hardly seems to serve as a foundation for the rocket ship revenue ramp Keith is implying. An astute reader will also notice that another $778,000 of quarterly revenue -- or another 16% of total revenues for the quarter -- is derived from "Corporate Accounts". This term also is not explained in the propaganda document. Again, allow me to explain. "Corporate Accounts" are the leftover deals from the Corporate Sales ("Brontosaurus") business model that RealNames previously adhered to. The $778,000 in revenue for the quarter represents the small amount of revenue that RealNames was either able to preserve from existing deals that hadn't yet expired, or from new deals where companies inexplicably agreed to pay thousands of dollars for keywords despite the fact that they are available on RealNames' website for $299. Finally, let's examine the "Registry Rights & Service Fees" line item, which accounted for $398,000 -- or 8.2% of total revenue -- in the first quarter. This revenue line represents the "registry" fees that RealNames charges to allow the operation of exclusive franchises in overseas markets. But these deals are not replicable, as the decline in sales from Q4 to Q1 would suggest. The deals that RealNames has managed to pull in consist of opportunistic, "low hanging fruit"-type deals with companies that have credit records even more spotty than RealNames. These companies include household names such as Keywords Global South Africa, Net4India, Lodger, HinC and Abesee. Even Keith would probably admit that these registry fees are not sustainable in the long term. In fact, RealNames hired CapGemini Ernst & Young's investment banking practice in London (at a hefty fee, of course) for the ridiculous idea of "auctioning" off registries in the UK, France and Germany. After many months of trying to pawn off the registry licenses, and hundreds of thousands of dollars spent, the effort failed miserably. These examples merely serve to highlight the embellishment of RealNames' financial history and future prospects. I am sure that Keith will protest and say, for example, that despite the fact that an astonishing 69% of RealNames' revenues for Q1 2002 were derived either from affiliate programs or the company's old business model, it was poised to execute on the new "registry/registrar" model. He will undoubtedly point to the more than doubling of Keyword sales through the channel from Q4 2001 to Q1 2002 as evidence of the rocket ship ready to launch. The problem is, one quarter's results do not establish a trend. If they did, why did RealNames' own registrar revenue decline in Q4 2001, and then increase again in Q1 2002? But I digress. As I was saying, the new model did not work any better than the old model. In fact, the new model was arguably worse because now, in addition to continued poor financial results, RealNames was pushing the limits of Microsoft's patience by approving names that did not comport with the Agreement -- even after the agreement was amended to provide for "Basic Keywords" and "Keywords Plus". Keith claims here on his website that Microsoft's "accusations of poor quality names are simply unfounded and disingenuous", but this email from June 2001 suggests otherwise. It is but one representative example. There are countless others. For anyone at RealNames whose job entailed any contact whatsoever with Microsoft, there was little doubt that the Microsoft relationship was in serious jeopardy by mid-2001. To be sure, RealNames did not know with certainty in July of 2001 that non-renewal of the agreement was assured. However, the writing was on the wall. Add to this the clear negative body language RealNames was getting from Microsoft in their meetings, and Microsoft's periodic threats to take "drastic" measures in response to RealNames' repeated data quality screwups, and it did not take a rocket scientist to conclude that RealNames was in a big hole. We all knew it. The only person, it appears, who didn't know it was Keith Teare. Keith continued to treat a renewal as a virtual certainty, and denied that non-renewal was even a realistic possibility, even up to the bitter end. He quashed any differing viewpoints and continued to provide rosy reports to the Board of Directors about the business and the prospects for a Microsoft contract renewal. John Krass of Microsoft told RealNames flat out in December of 2001 that Microsoft likely would not renew the agreement, and that, if it had to make the decision right then, it certainly would not renew. RealNames was also told repeatedly that there would be no escaping our obligations under the $25 million of debt owed to Microsoft. On his own website, even Keith admits that Microsoft gave him repeated "messages since March 2002 that [non-renewal] was likely." So why then, do you ask, would Keith continue to drive the car off the proverbial cliff in the face of a mountain of evidence pointing to non-renewal of its "bet the company" distribution agreement? Many would say it is because Keith is the eternal optimist. I, however, think it is because he had no other alternative but to keep driving towards that cliff in the blind hope that Microsoft would build him a bridge before he got there. Keith had made his bet on Microsoft -- he reorganized the entire company's business model around distribution of DNS-like Keywords through the browser, even though the agreement upon which that distribution was based did not permit RealNames to sell Keywords without quality control. He caused the company to sever all other distribution relationships (e.g., Google & AltaVista) and to abandon all other methods of distribution (e.g., a browser plug-in or a possible OEM deal for Keyword-enabled browsers on the desktop of new PCs) in favor of a "bet it all on black" strategy with Microsoft. Now that this bet was starting to look like a loser, he had nowhere else to turn. 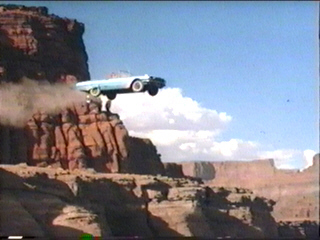 Is anyone really surprised the car flew off the cliff?